The interface is very straight forward and it has some pretty nice features. From the start screen you can select New Ride, Settings, News, or My Rides. Obviously you would start at New Ride the first time you fire up the app. The first thing you're asked to do is enter a Ride Name, pick anything you like, you know me it's something simple like SEZ 047. How creative! Next select +SONG and it takes you to your song library on the iPod, which you can sort by Playlists, Artists, Songs, Albums. I generally have always pulled my songs into a playlist using iTunes since it gives me access to my full library, but if your so inclined you can select them by scrolling around your iPod. Even if you have an entire playlist pre-made you'll still need to select each song individually, they'll just be easier to find by sorting on the Playlist view. Next you select NOTES, where you have the ability to drop in Free Formed text notes. Whatever short hand you desire works here. I would suggest you come up with some iPod short cuts for things you enter a lot; I do exactly that for Class Builder™ as well. You can enter 4 sets of notes per song. Technically you can enter more than 6 lines of text per note, but you won't actually be able to read any notes beyond the first 6 lines (with the small font) during the class unless you scroll. 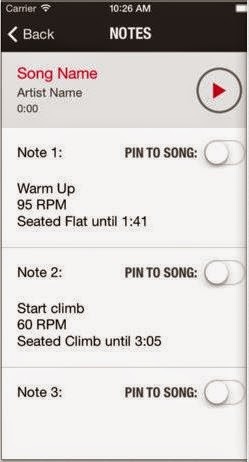 The have an interesting feature for notes that allows you to PIN TO SONG. This is something I did very early on using the album graphics of the iPod. I never really could appreciate it with my method, but Schwinn's approach would probably work well. Essentially once a note is pinned to the song every time you put that song in your playlist it auto-populates the notes. This would work well IF you always used a song for a particular movement. A good example is I always use AC/DC's Thunderstruck for a Standing Climb. If it was pinned, you wouldn't need to enter the notes, just select the song and your good. This would be a neat way to put together playlists on the fly as long as you're not trying to emulate a real terrain. Schwinn also gives you a cool feature under an unassuming button simply labeled with a megaphone and the letters SFX. Prior to starting your ride pressing this button will allow you to preselect 2 sound effects from a library of 10 including sounds like Whip Crack, Whistle, Train, Thunder, etc... It doesn't actually put them into your play list, but it gives you easy access to them during your ride so just for fun if you want to inject a Applause sound at the end of your Race Day, you're all set. This feature is a big thumbs up for me because I currently have to remix in sound effects into my music which is why I hardly ever do it. 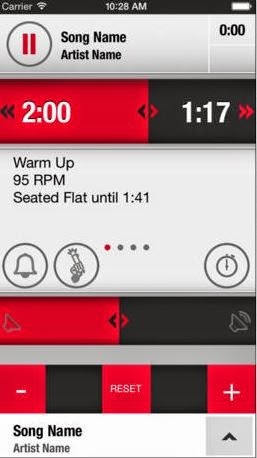 Before starting your ride, jump on over to the Settings button and select Cross-Fade and set the time from 0-6 seconds. This is a feature I've wanted for a long time from Class Builder™ to eliminate that odd gap between songs. Not as good as mixing your music, but not near as time consuming either. Now for the over 40 crowd you can also select the Font Size from small to large so you won't need your bifocals. No I am not picking on you, I'm commiserating with you. I've had bifocal contacts for 3 years now. Grrr! song. You have two quick buttons to access your preselected sound effects, and you have a stopwatch button. Down at the bottom of the screen you see a - RESET + bar. This allows you to quickly adjust the tempo of your music on the fly. Something I think that's better suited to the standard Group X class more so than cycling, but a neat feature none the less. Again it would be better suited if it was automatically stored per the song so you didn't need to make manual adjustments while coaching. Both the timer and volume are the standard iOS scrubbers allowing yo to quickly adjust where you are in the song or the volume. This is both good and bad. I like having my iPod on the handle bars so that I don't need to constantly turn my head over to the stereo. Couple that with the fact that I typically lose 3 lbs of sweat during a class and you might see the issue. Drips of sweat will land on the screen (even though mines in a clear armband to hold it in place) and will adjust these easily accessed buttons. Notice the instruction set on the right shows Seated Flat until 1:41. That's because there are nothing that triggers the next set of notes to automatically pop up. You notice the 4 dots in the middle of the screen, that shows you which note you're on so you have to use your finger to scroll left and right to the next instruction and up/down to read your longer than 6 lines of notes. 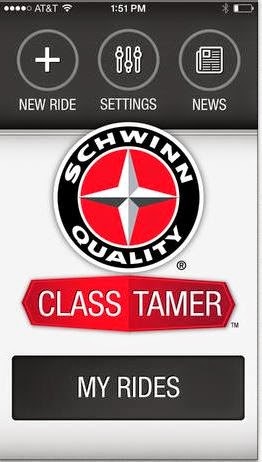 The Schwinn Class Tamer is a great app for the beginning instructor. Allowing you to store your rides electronically rather than managing a notebook or a bunch of sheets of paper. 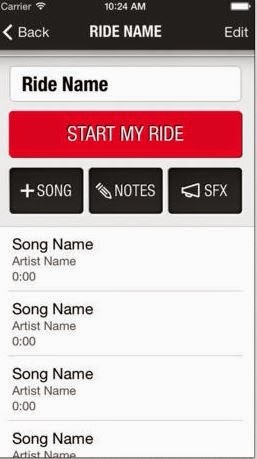 Your rides are automatically backed up via iTunes, but you can always export a text copy of the notes via email if you want to share the profile. It doesn't have some of the higher end features like displaying of your heart rate chart, album graphics, or video like Class Builder™. I think the greatest weakness of the app is that it still requires a fair amount of interaction with it during the class since the instruction notes don't automatically trigger at predetermined points in the music. It also doesn't seem to integrate Spotify music for your playlist, which is one of the newest features of Class Builder™, but for the money it's hard to go too far wrong.